Bounce is randomly giving away 500 free Bounce bars on their facebook page. Click here to like them and then on the “Dryer Bar Giveaway,” fill out the form to try your luck. I want to try one! have a brand new energy smart dryer, would love to continue the energy smartness!!! with a dryer bar. Very anxious to try this !!!! I’d love to try one!! Haven’t had the chance yet! i’ve used bounce for several years and the product is great. Only softener products I use! Ilove these I buy them all the time. Thanks for the oppertunity to try this product! Anxious to try this product. I love bouce! Thank you! I tried to enter but the submit button is in the middle of the text and not working properly…I reloaded twice but same issue…What’s up with that? I love them and use them all the time….nothing else compares! 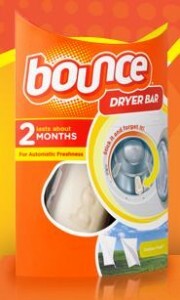 I love Bounce~ Would love to try the dryer Bar! Use Bounce dryer sheets would love to try the bar. have a new dryer…would love to try Bounce.